“Carl’s Jr. has always had great success introducing menu items that deliver more authentic tastes and flavors than our competitors would ever attempt,” said Brad Haley, executive vice president of marketing for Carl's Jr. “So, we naturally wanted to prepare guacamole like people do at home, with real avocados and fresh salsa, to make our Guacamole Bacon Burgers taste like something you’d be more likely to find only in sit-down restaurants." 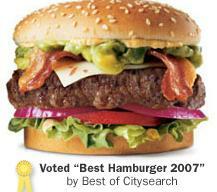 The Guacamole Bacon Six Dollar Burger ($4.99) was introduced in 2003 and won Citysearch's "Best Burger of 2007." And this year it is the official burger of the 2008 California Avocado Festival. Now Carl's is also offering a Single Guacamole Bacon Burger ($3.29) and a Double Guacamole Bacon Burger ($4.29). Other fast food eats that we've written about that include guacamole are Quizno's Turkey Bacon Guacamole Sub, Taco Bell's Guacamole Bacon Grilled Burrito, and El Pollo Loco's Chicken Nachos.